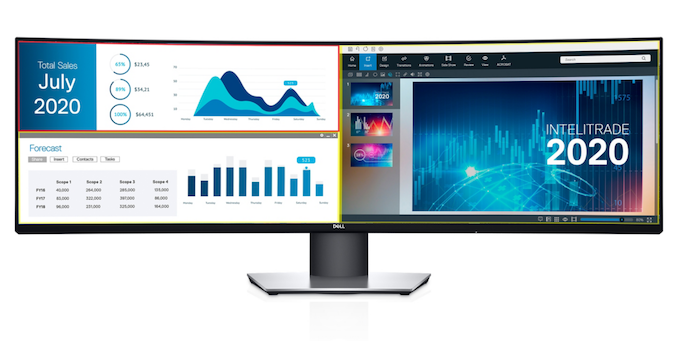 Dell has introduced its ultra-wide display featuring a 49-inch diagonal. The large monitor with a 32:9 aspect ratio is aimed primarily at business clients who currently use two 24 or 27-inch LCDs. The monitor features multiple inputs, including a USB-C port. The unit is also outfitted with a KVM switch. The Dell UltraSharp U4919DW is based on a 49-inch IPS panel featuring a 3800R curvature, a 5120×1440 resolution, 350 nits brightness, a 1000:1 contrast ratio, an 8/5 ms response time (normal and fast modes), 178º/178º vertical/horizontal viewing angles, and a 60 Hz refresh rate. The display is among the first monitors of this size to use an IPS panel featuring a wide “5K” resolution as numerous rivals released so far relied on VA-type panels with a 3840×1080 resolution. The new LCD can display 99% of the sRGB color space, which is good enough for most business customers who primarily use productivity applications and who do not need things like AdobeRGB or DCI-P3 color spaces. The unit comes factory-calibrated at Delta-E less than 2. 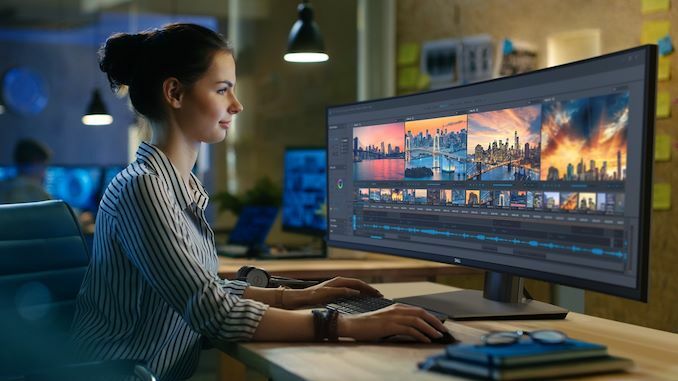 The UltraSharp U4919DW monitor is equipped with two HDMI 2.0 ports, a DisplayPort 1.4 port, and a USB Type-C port that can deliver up to 90 W of power, which is enough even for most 15-inch laptops. 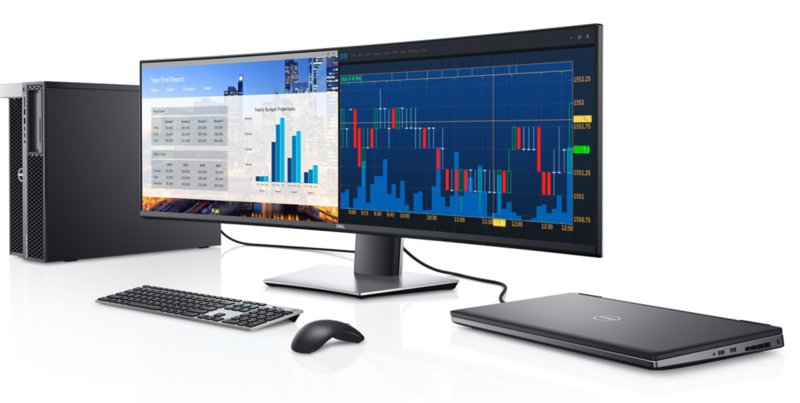 Like other large displays, this new one from Dell supports Picture-by-Picture functionality and therefore can be used for two PCs simultaneously. One important feature of the U4919DW is built-in KVM that can switch from one connected PC to another on the fly. In addition, the new UltraSharp features five-port USB 3.0 hub and two USB 3.0 upstream ports. To make the display more comfortable to use, it is outfitted with a stand that can adjust height, tilt, and swivel. Dell will start sales of its UltraSharp U4919DW in late October. Being aimed primarily at B2B customers, the display is relatively costly, and carries a $1,699 price tag, which is well above that of VA-based LCDs of this size. On the other hand, since the product is designed to replace two high-end QHD 27-inch monitors, $1,699 might look like a reasonable MSRP. Dual monitors are pretty cheap, but you can bet if someone asked me for my requested hardware (software development), this would be on my list. a bit late in the day i know, but Samsung LC43J890DKUXEN 43.3-Inch is 32:10 (3840 x 1200). That's great! I use 2 24 inch monitors (at home) and I am business client.